With a variety of models to choose from, smart speakers offer a wealth of features to manage your home, listen to music, get the weather forecast and more. Apple's HomePod, which was announced on June 5, 2017 and released in early 2018, features a high-excursion woofer with a custom amplifier for rich bass. Powered by Apple's A8 chip, the HomePod has spatial awareness that automatically adjusts for optimal sound. 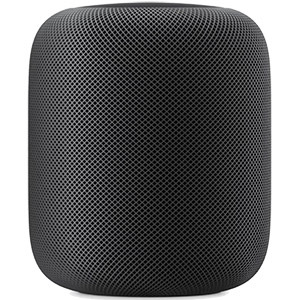 Available in White or Space Gray, the HomePod measures under 7 inches tall to fit anywhere in your home, and retails for $349.